The ADC Pro by Brunton is the most comprehensive data center available for both back-country explorers and outdoor professionals alike. This device measures, counts, tracks, interprets, forecasts and logs nearly every aspect of your trip. Empower yourself with the knowledge needed to thrive in the outdoors. Can the atmospheric data centers display imperial and metric measurements? All data can be displayed in either imperial or metric measurements. Click reset button to choose measurement displayed when in the Wind, Temperature, Barometer, or Altitude display screens. Why does the elevation begin to change after I set it, even though my ADC has stayed in the same place? The altimeter function of the ADC Wind, Pro and Jetset uses the unit's barometer to determine elevation. Since the ADC is very sensitive to barometric pressure, if weather patterns are changing, resulting in a rising or falling barometer, the elevation readout will also change. How often should I calibrate (set) the elevation to a known point of elevation? We recommend calibrating your elevation at least daily when using your ADC as an altimeter. You can use known benchmarks or topographic map data to determine elevation. 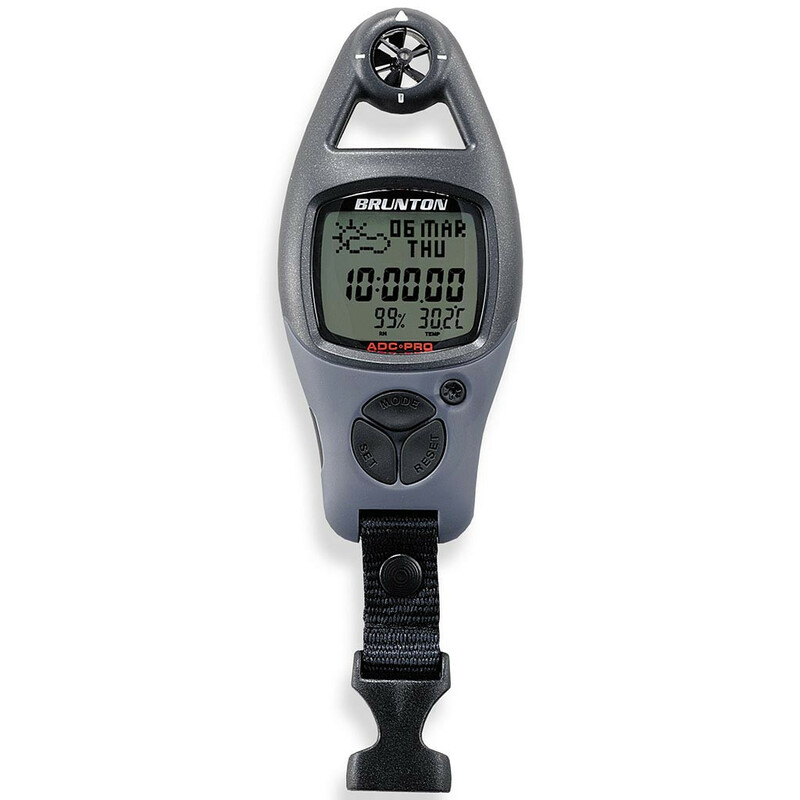 How accurate is the altimeter once it is calibrated? Once calibrated, it is accurate to +/- 3 meters (10 feet), unless weather changes occur since the last calibration. Why does the barometer on my ADC Pro not read the same as my local weather station? Your ADC reads true barometric pressure, not barometric pressure relative to sea level. If you happen to live very close to sea level you will notice that there is little, if any difference between the barometric pressure reported locally and the reading on your ADC. The higher you are in altitude, the more difference you will see between the true barometric pressure on your ADC and pressure relative to sea level as reported locally. Also, keep in mind that even after adjusting for pressure relative to sea level, there may be significant weather pattern differences between your location and the location of the nearest reporting weather station. What kind of battery does the ADC's take? The ADC's take one CR2032 Lithium battery. These are very common and can be found at most general stores where batteries are sold. How do I turn my ADC off? Just like a watch, the ADC units do not turn off. The battery will last about a year with normal use. The Brunton Company warrants the ADC Pro to be free of defects in materials and workmanship for two years.